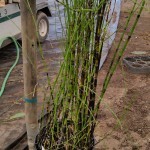 Bamboos are a group of woody perennial evergreen plants in the true grass family Poaceae. There are 91 genera and about 1,000 species of bamboo. They are found in diverse climates, from cold mountains to hot tropical regions. Even though bamboo is a grass, many of the larger bamboos are tree-like in appearance. For more information or to order, contact us at +1 561 270 7352 or sales@miamitropicalplants.com. We look forward to serving you!